What are the benefits of 3D printing for jewelry? How to make 3D printed and customized jewelry at home? Jewelry, an ancient craft, is increasingly turning to the modern technology of 3D printing to improve jewels conception and production processes. The top applications of 3D printing for jewelry are in prototyping and direct manufacturing of jewelry. 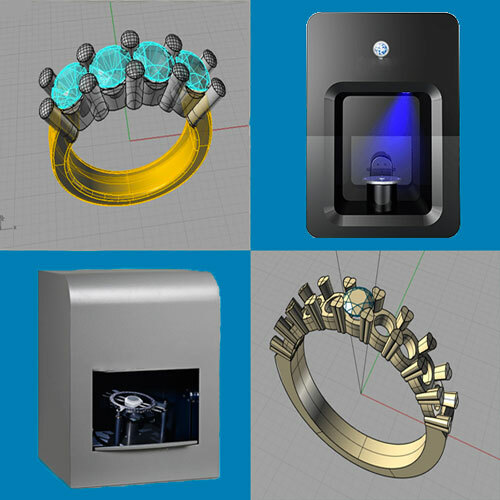 Prototyping: professionals in the jewelry sector can save time and money by using 3D printing. Indeed, jewelers can make cost-effective plastic prototypes of jewelry pieces before sending the final design to production. Making patterns for casting: 3D printing can also be used in the manufacturing process of jewels to make patterns for investment casting. 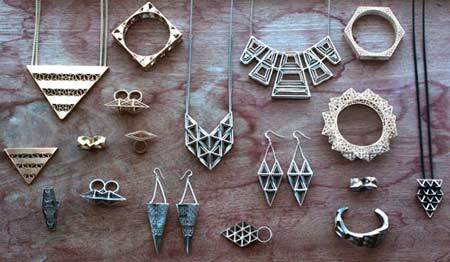 Direct manufacturing: it is possible to resort to 3D printing to make actual jewels by using metal 3D printers. As metal 3D printing is still an expensive technology (metal 3D printers are quite costly! ), users often send their 3D designs to 3D printing services such as Shapeways or Sculpteo. These services offer a wide range of 3D printing materials, including several precious metals such as silver, gold or platinum. The main technologies used for 3D printing in jewelry are SLA or DLP. These resin-based 3D printing technologies allow to 3D print objects with a very smooth surface and a high-level of details– two requirements for jewelry 3D printing. Many 3D designs directories offer 3D designs of jewelry that are ready-to-print on a desktop 3D printer. 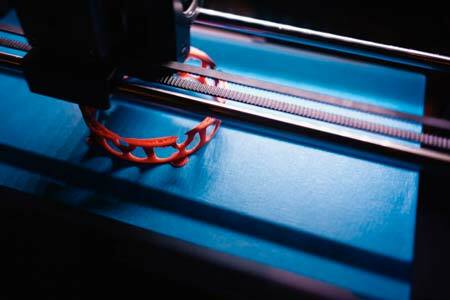 Of course, there are limits depending on the type of material a 3D printer can use, either plastic-based filament for FFF 3D printers or resins for SLA 3D printers. However, with exotic 3D filaments, it is now possible to print “metal-like” objects with a regular desktop 3D printer. Jewel with 3D printed cast. Answer: it’s to filter the UV light entering the 3D printer and prevent the resin from solidifying. Cost-effective: it can be cheaper to produce a prototype of a jewel using 3D printing than a traditional fabrication technique or tool, such as CNC cutting. Fast: using a fast prototyping or manufacturing process such as 3D printing can significantly shorten the product design and production cycle. No limitations on 3D designs: 3D printing allows making complex shapes and intricate designs which would be impossible to achieve with traditional prototyping/production techniques. This aspect is important in a creative field such as jewelry. A very efficient technique to make jewelry relies on the fabrication of molds. Lost cast molding is a popular technique for directly producing metal jewels from 3D printed models. In this case, a 3D printed model of the piece of jewelry is first made of thermoplastic wax. 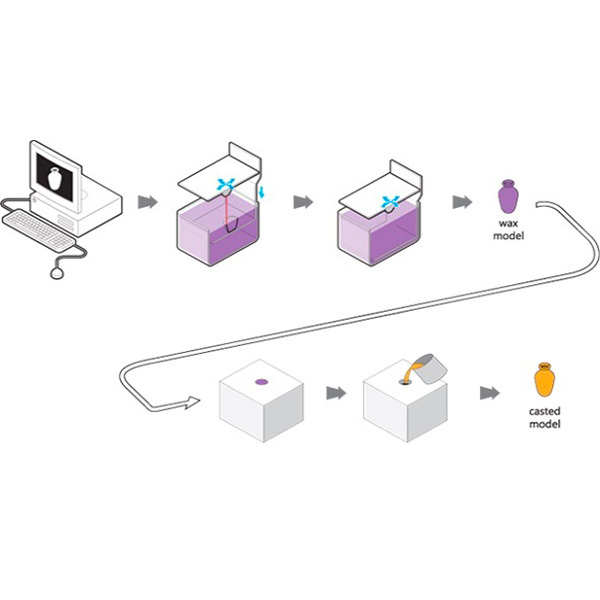 Then, a mold (also called investment) is created around the 3D printed jewel. The investment is heated until the thermoplastic wax consumes. More information about 3D printing for professionals jewelers is available in this Quora thread. From there, the liquid metal (gold, platinum or silver) is then poured into this digitally-designed mold. Once it’s cooled, the jeweler can add gemstones. Stereolithography (SLA) is very efficient with a high degree of precision and compatible with specific resins. 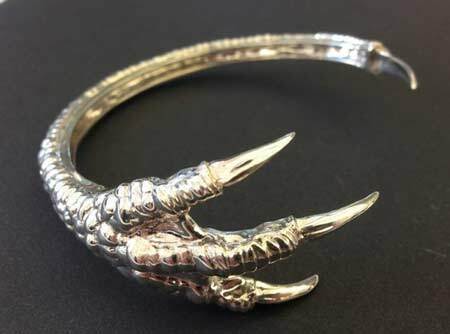 The Dragon Claw bracelet, 3D printed in metal, by Dropping Form Designs. 3D printing makes it possible to manufacture small, complex, metal parts at high quality and speed. One popular technology for jewelry is Direct Metal Printing (DMP). Compatible materials are standard metal alloys and ceramics. In this case, it is also possible to work directly with precious metals and make custom jewels on demand, without any stock. The parts do, however, usually require some manual finishing for a perfect look. Most often, the 3D printing technologies used in jewelry applications are resin-based 3D printing technologies: mainly SLA (stereolithography) or DLP (Digital Light Processing). The best 3D printers for jewelry use the SLA and DLP technologies because resin 3D printing can produce higher quality prints and smoother print surfaces than extrusion (FFF) 3D printers, which use plastic filament as printing material. 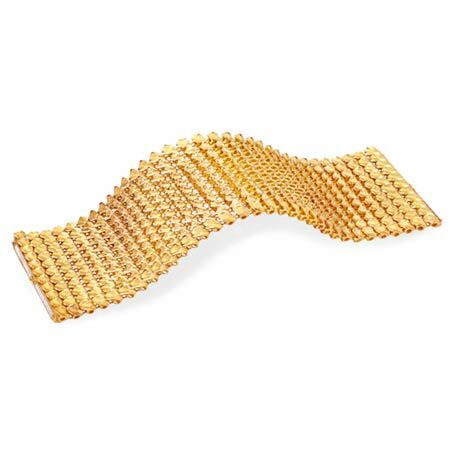 3D printing resolution is critical in jewelry applications because the final products, jewels, are often tiny objects with a high level of details. Smooth surfaces are also required when using 3D printing to create molds for investment casting for example. 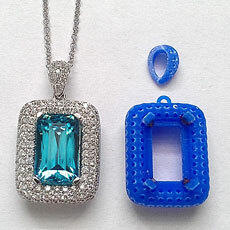 There are several 3D printer brands specializing in jewelry applications. The prices start from a few thousands USD for entry-level desktop 3D printers using resin technologies. For more advanced 3D printers specifically designed for jewelry applications, prices can go much higher based on a variety of criteria, from print resolution to build volume, print speed and more. If you are interested, we can provide a free recommendation of the best jewelry 3D printers, based on your specific needs and budget. 3D scanning jewelry gives you many advantages. This process allows you to get a detailed CAD file of a piece of jewelry, and capture a high-level of details. 3D scanning a piece of jewelry to obtain a detailed CAD file of the piece. This 3D file is much more accurate than a picture, as every single detail and shape will be captured by the 3D scanner. Storing such digital files for later use (showcasing, archiving, modifying designs etc) is then easy. Creating a new design based on an existing jewelry piece. You just need to 3D scan the original model and make your modifications in the CAD software. You can then 3D print the model to build a mold for your new designs for example. Capturing a high-level of details, more than any bare eye observation could. 3D scanning a jewel allows you to easily identify any defaults or design flaws. Repairing a broken or damaged jewel. Thanks to the high accuracy offered by 3D scanners, you’ll be able to design a perfect fix for the damaged piece of jewelry. In such cases it can be all the more interesting to use 3D printing, in order to 3D print a custom mold for the fix piece. Replicating existing pieces of jewelry. 3D scanning might be useful if you need an accurate copy of an expensive piece or if you want to reproduce an existing jewel. 3D scanning benefits for jewelry. The best 3D scanners for jewelry are designed to capture a high-level of details on small objects. 3D scanning can bring several advantages to the design and production processes in jewelry, but capturing pieces of jewelry in 3D can be challenging. Indeed, 3D scanning small objects with a high level of details requires specific 3D scanners with a high resolution. Besides, 3D scanning transparent or translucent objects is a difficult task which can be achieved by using of a specific coating powder or spray to enable the 3D scanner to “see” the object. The best 3D scanners for jewelry are designed to capture efficiently tiny and detailed pieces. These desktop 3D scanners can be enclosed or open and they are usually based on a structured light technology. Several 3D scanners brands have developed 3D scanners to specifically address the needs of jewelry professionals. If you are interested in, we can make a free recommendations of the best jewelry 3D scanners depending on your specific needs and budget. Jewels and fashion accessories are some of the easiest objects to create with a 3D printer. They are simple to design and easy to 3D print. Custom 3D printed necklace by American design studio Nervous System. Where to download 3D printing jewelry files? Many online platforms offer a wide choice of 3D files for jewelry. Thingiverse and Cults3D have hundreds of different designs, downloadable for free or a small cost. In many cases you can even contact the designers and request specific customizations. Before printing the 3D file of the jewel, the most important things to check are the scale of the model and its orientation on the printing bed. Most common personal 3D printers use the Fused Filament Fabrication (FFF) to create objects in plastic. They offer lots of colors and are great for 3D printing costume and fashion jewelry. 3D printed rings, bracelets and pendants are easy to design and simple to 3D print at home. With several options of shape and size, 3D printed plastic jewelry and fashion accessories are some of the most accessible objects produced by 3D printers. A Makerbot 3D printer building a custom bracelet. Without a 3D printer, it is still possible to get the perfect customized jewelry design by using online 3D printing services. Almost any material is available: precious metals such as gold or silver, ceramics or colored plastics. How to design 3D printing jewelry online? Online 3D software also enable customers to create custom jewelry in 3D. These software are easy to use and offer preview of the future of creation online, directly inside the web browser window. Jweel, for example, offers several basic 3D models to customize, such as rings or pendants. They also have a wide range of more than a thousand jewels. Fathom & Form Jewelry, a San Francisco based jewelry studio, used 3D printing to create a line of geometric jewels. Where to buy 3D printed jewelry and customized jewelry? With online jewelry services, shoppers can choose from customized designs and have the finished product delivered at home in a few days. Companies like Sculpteo and Shapeways have a large choice of jewelry designs. These online 3D printing services provide a great material choice for fitting both their customer’s tastes and wallet, from plastic to precious metals. Bitstailor, a French startup, is specialized in the creation of custom-made 3D printed jewelry and fashion accessories. The Bitstailor team works closely with their clients to co-create unique pieces, which are then 3D printed and shipped, worldwide. Easy! Boltenstern jewel realized with 3D printing for jewelry. Marie Boltenstern, daughter of the owner of the Boltenstern jewelry in Vienna in Austria, decided to use 3D printing to create unique pieces. The “Resonance” collection is designed to fit perfectly the part of the body they’re worn on. Like fish or snake scales, these 3D printed pieces of jewelry are made of tens of small 3D printed scales attached together to move fluidly around the body. To build these scales or tiles, she used a metal 3D printer. Creating this unique piece of jewelry by hand with such intricate patterns would have been highly time-consuming and much more expensive. It is important to keep in mind that 3D printing is not meant to replace jewelers, rather it is a new tool allowing them to explore further in terms of creativity and improve the conception and production phases. Another brand using 3D printing to push further their quest of the perfect jewels the famous brand Graff Diamonds. Their Head of Technology, Sam Sherry, says: “These machines go beyond what the human eye can see and what the human hand can do with a saw frame”. For Graff Diamonds, it is essential that their workers are classically trained and use 3D printers as another tool to create more challenging and intricate shapes. 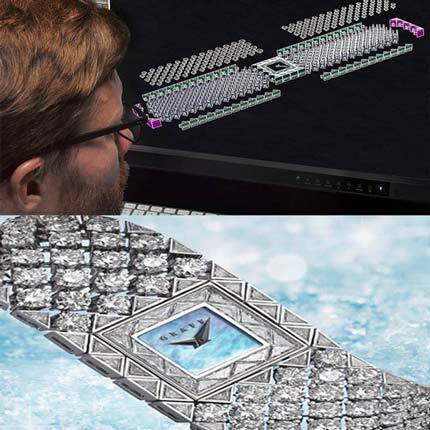 According to them, the best jewels they created using 3D printing can be found in the Snowfall Collection. The pieces were first printed in liquid resin using the SLA technology and then casted with fine gold. The precision offered by 3D printing allowed Graff Diamonds to take their art and skills to the next step. And as Mr Graff, the company director, says “If you don’t move forward with technology, you’ll eventually be left behind”. 3D printed jewel made by Graff Diamonds.